Influential Drones has the advantage of experience. BEFORE TIME MAGAZINE’S MA Y 2018 SPECIAL REPORT STATING THAT WE ARE “IN A DRONE AGE,” TWO YEARS PRIOR, two entrepreneurs teamed up to launch a company called Influential Drones. Steven M. Davis and David M. Krause came up with the idea while self-assessing the condition of the aviation industry and the pilot shortage in the United States. Davis is a commercial pilot of 20 years and an FAA-certified flight instructor. Krause was taking manned aircraft flight lessons from Davis; his expertise is as a software architect, formerly employed by IBM. The journey these two have made involves not just their experience, but nationwide travel to get a pulse on the industry and likewise acquisitions to get the best equipment in an evolving market. We spoke with Krause and Davis at their office at South Jersey Regional Airport to learn more about the company’s capabilities and what separates them from others in the field. Influential Drones has the advantage of experience. They offer a wide array of residential, commercial and industrial services revolving around imagery and post-editing. Services relating to photography and videography can be utilized by those seeking a erial inspection work or coverage, consisting of outdoor events, fireworks displays, wedding “wow” shots, golf course coverage, highris e structures, construction sites, movie/television live-productions, as well as commercials and social media marketing campaigns. They o ffer several hands-on drone training programs and manned aircraft flight instruction through Davis’s credentials. Th e company is able to sell dr ones and repair them. They can also refer drone insurance through an affiliate program. Influential Drones presently has an active fleet of nine diversified drones, and one manned dual engine airplane. They have drones that can carry equipment and fly in s now and rain. 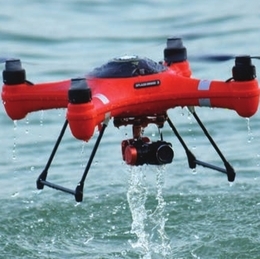 Drones that are waterproof and even one drone that can take off and land from the water. As dealers of drones and equipment, the advances in technology are at their fingertips. To our surprise, they have Strategic Alliance agreements with other businesses , so that they have access to more drones, oth er manned aircraft and more specialized services. “We can’t be the best at everything so we identified wh om we thought were great at what they do and created alliance agreements to make us better,” says Krause. Influential Dron es improved their training curriculum, cinematography and social media promotion assistance programs as a result of such agreements. They already had the ability to perform thermal imaging, drop/carry tasks and perform NDVI (normalized difference vegetation index) agricultural scans. “NDVI in simplistic terms is a composite picture used to determine the health levels of plants. This is of benefit for environmental missions and for agriculture,” says Davis. “We also have a 180-magnifaction zoom camera that can see over one mile away. We use that for inspections to maintain a safe distance from critical infrastructure,” adds Davis. Presently the industry dicta tes a drone operator obtain an FAA Small Unmanned Aircraft System certificate ( FAA 14 CFR Part 107) which the In- fluential Drones team ha s. Davis has a commercial and flight instructor certificate for fixed wing single and multi-engine aircraft with instrument privilege s. He has a seaplane rating and a taildragger endorsement. Krause has logged over 40 hours as pilot in command of an aircraft, however still is a student ( FAA 14 CFR Part 61). Both men have TWIC cards. Krause has OSHA credentials and completed a FEMA course to fly a dron e in disaster situations. Influential Drones maintains a commercial operations license with the division of aeronautics to perform power line, pipeline, survey and thermal UAS work in Minnesota. They are licensed to operate drones with the division of aviation in North C arolina. All of their drones are each annually insured for $1 million liability. Krause leveraged his corporate background to create a structured business. “We operate above the federal minimums,” states Krause. “We are not the cheapest drone company out ther e, because we aren’t the guys with hobby drones stopping our cars on the side of the road to bypass legal procedure,” he adds. Being well-versed in drone technology coupled with real-life aviation experience undeniably gives Influential Drones a level of excellence “Above the Best.” “Our knowledge and understanding of the commercial aviation industry, allows us to apply the best pract ices and principles pertaining to drones,” Davis says. That attention to detail also means they put the utmost importance on safety, taki ng every precaution necessary to minimize risk while consistently delivering results.